Travelling abroad for first time? Trying to know all you can about forex rules and regulations? Whether you are a seasoned or first time traveller, you can be mislaid by popular misconceptions about forex. Myths are like unwanted gossip that does not provide any concise and useful information to you and the only way to beat it is to become knowledgeable. 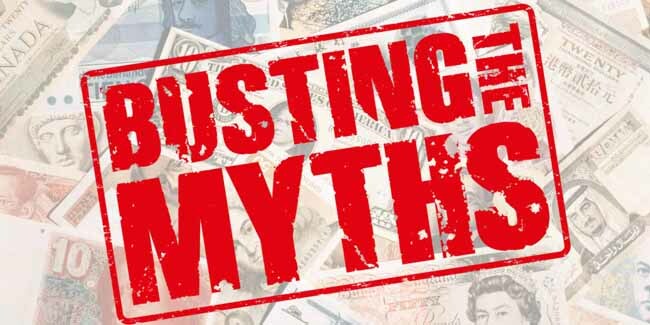 So here are 10 myths about forex that we will bust today! Forex cards or prepaid travel cards are an excellent means of handling money when travelling overseas. They can be swiped at PoS machines for shopping and in ATMs abroad for withdrawing money. Prepaid travel cards have many advantages vs cash, debit and credit cards. We can preload these cards with the foreign currency we require and can even load multiple foreign currencies. That’s why these are also called multi-currency cards. Also, when transacting abroad with credit and debit cards, currency conversion charges to the tune of 3-5% will apply since Rupee is being converted to foreign currency. Whereas using forex cards, this can be avoided as currency is already that of the foreign country. ExTravelMoney is an online forex platform where you can compare and buy prepaid travel cards from banks and money changers near you. When travelling abroad one of the factors which bloat up the cost of the trip is forex. You can reduce costs on currency exchange by comparing the costs for the service offered by different banks and money changers using ExTravelMoney. Apart from the cash in hand, for further expenses, you can load the money in forex cards and cut back on currency conversion charges which would be present if we used an Indian debit card or credit card abroad. Also, in case of fluctuation of the forex market, you’ll be protected since currency in forex cards are loaded at fixed rates and thus you would be immune to changing currency exchange rates of the market. Airports fleece travellers with their currency exchange rates. Research well ahead of your trip for money changers near you who offer currency exchange for the least amount of your money. You can take the help of forex aggregator sites like ExTravelMoney to find and compare rates by banks and money changers and even order the forex product online. Sometimes airports charge as much as 7-8 times markup compared to money changers! The RBI rules in regards to this are ; you can carry up to $3000 in notes and coins or it’s equivalent in other currencies and up to $10000 USD in forex cards, bankers draft or traveller’s cheques when going abroad . For more than that, you need to complete paperwork like CDF (Customs Declaration Form). In the case of sending money abroad, you can remit money how much ever times you want up to $2,50,000 (FEMA limit) per year for outward remittance. This amount is more than enough to take care of study abroad, medical and maintenance expenses abroad for your loved one or close relative. Fact : Money changers usually give a better deal on International money transfer than banks and are equally safe. Banks charge higher rates for money transfer abroad compared to money changers and also put the onus of completing paperwork on the customer. Money changers offer better rates and rank higher on ease of doing business with good customer support. So next time you want to transfer money abroad, look out for money changers in your area. ExTravelMoney has more than 4500+ forex partner outlets, spread across the country. Find yours now! #Myth 6 : If we lose our forex travel card while travelling, the money in it is also lost. Fact : The money in the forex card can be transferred to the backup card which comes along with it. Nowadays, whenever a prepaid forex travel card is issued to a person, a secondary card is also given along with that to act as a backup in case of loss/damage of main card. So when the first card is no more, call up your bank or money changers helpline number and explain the issue to them. The first card will be deactivated and the balance amount in it will be transferred to your backup card, which you can then use. Prepaid travel cards have different charges associated with them depending on the issuing authority. There may be charges involved for each use of ATM services abroad. So before purchasing your forex card check carefully for its associated charges. For paying restaurant bills and for shopping abroad these cards will perfectly do the job without any additional costs levied on you. According to the latest RBI regulations on forex , Forex can be purchased as much as 180 days prior to your date of travel. You simply need to have documents like Passport, Visa and Air-Ticket as proof. While travelling abroad, if you run out of currency to take care of your expenses, then your spouse or close relative in India can recharge your forex card. The category of people who can make payments for you are listed as “close relatives” by RBI and it includes your spouse, Parents, siblings, child and in-laws. Fact : There are many services in India which simplify this process and make it easy to buy a forex product online, from the comfort of your home. ExTravelMoney.com is one such service that gives you a simple four step process and delivers forex right to your home with home delivery option. Enter location → Compare rates → Choose best rate & Order → Get forex door delivered! ExTravelMoney uses the power of technology to bring forex services right to your home. For buying forex or enquiring the exchange rates of different banks and money changers it is not necessary to physically visit the forex store and you can check online itself from extravelmoney.com. Even the icky details like documentation process for forex transactions are taken care of giving more free time to you. Remember to exchange money for your travels with ExTravelMoney!